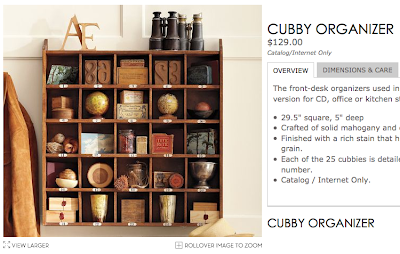 Last week I picked up this cute Cubby Organizer at the Pottery Barn outlet for $50. I really bought it because I think it will make an adorable advent calendar during the holidays, but I want it to be a display piece that I can use year round. I looked around the house for a good spot and finally found the perfect place above the West Elm desk in the corner of our living room. The challenge with a piece like this is that you then have to fill it with cute things. Like my Wisteria shelf that needed to be styled up, this cubby needed to be styled with cute stuff on a miniature scale. Naturally Pottery Barn had its version filled with a collection of vintage objects that go perfectly with the cubbies, but I don't have a bunch of small collected vintage objects laying around (not yet, anyway). I wasn't about to go out and buy a bunch of stuff to display, so I planned to use things I had sitting around the house. When I started looking around, I didn't have that many small items available that would fit into the cubbies. I quickly realized I wouldn't be able to fill every cubby, so I decided to try to fill every other cubby. In our home, I like to bring in similar colors and textures throughout the rooms so it all makes sense together. This cubby organizer is a good example of that concept. In our living room, we have several glass touches for a little bit of *bling– two mirrors, a mercury glass vase and a mercury glass lamp. So I thought it made perfect sense to bring the mercury glass votives to the cubby organizer. We also have touches of blue and green throughout the rooms, so the ceramic birds helped bring in those colors. I just love pears and have a decent collection of them, so of course I brought one of those for the top right cubby. Then I filled in the rest of the cubbies with the white kitchen jars and a roll of hemp. I think the hemp ties in the natural textures we have by the fireplace, including this new woven basket and the manzanita branch on the mantel. Do you have a method for bringing your rooms together? My theory is that if you can stand in one spot and see the other rooms, it's nice to have something– whether it's a color, a texture, or something else– that brings them together and makes them feel cohesive. Now if there are bedrooms or other rooms you can't see next to each other, they don't necessarily have to relate as well as the rooms that adjoin each other.